In our last blog post (click HERE to read) we talked about baling with steam in very dry conditions. This blog covers how to effectively use steam in high humidity conditions where climatic or weather conditions do not allow the hay to become fully dry and cured. Steam is most effective at softening the crop material when the hay is allowed to fully cure and dry before baling, but even in the driest, most arid parts of the world, most farmers still experience periods of time where achieving complete dry-down of the hay prior to baling is nearly impossible. E.g., In Utah, we experience monsoon seasons in the late summer which make it hard to get fully cured hay. Some parts of the world find it difficult to ever get fully cured hay. In situations like this, where you may even be forced to bale with stem moisture, steam is still an effective way to retain leaves during the baling process. In high humidity conditions when you are unable to cure the hay completely and stem moisture is present, the use of a hay preservative along with steam treatment to maintain leaves can be effective. Hay producers know that during these conditions the leaves are often still dry and brittle, while the stems still contain moisture. Steam can be applied at moderate rates to soften and preserve the leaves while hay Preservative can also be added at appropriate rates to meet the requirements of overall moisture level of the hay being baled. When baling in these high-humidity conditions it is advisable to bale during the daytime hours when the hay is as dry as possible. The use of the Gazeeka Moisture Gauge is very helpful to ensure your bales are within a tolerable moisture range. The Gazeeka moisture sensor is a non-contact microwave sensor that transmits high frequency electromagnetic waves between two antennae. The two antennae are mounted on the baler so as to analyse the hay bale as it exits the baler. These moisture readings are then transmitted to a monitor in the tractor cab. It’s important that you monitor bale moisture and apply the appropriate amount of recommended preservative. For more information on judging bale moisture with the Gazeeka check out a previous blog by clicking HERE. In high-humidity climates many farmers first start to bale in the late morning hours as the dew begins to burn off of the hay, which provides for a small baling window before the hay becomes too dry. Then, as the dew sets back in during the evening hours, farmers again will have a short baling window before the hay becomes too wet to bale. These conditions make it difficult to not only produce consistent and quality hay but also to be productive with labor and equipment. 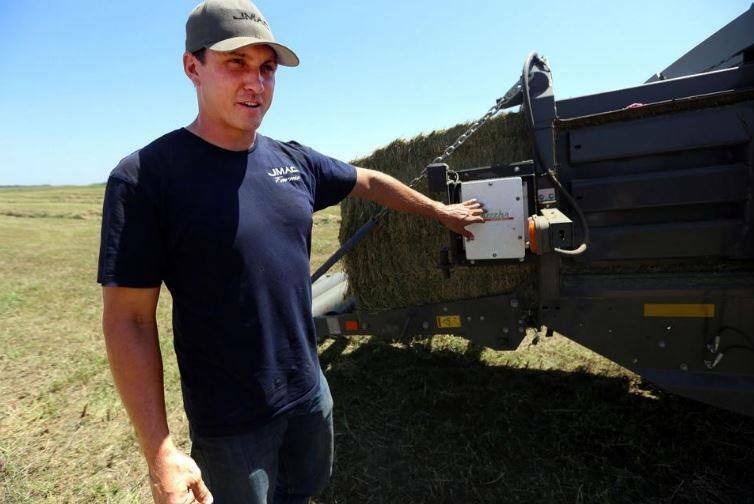 With the DewPoint hay steamer, farmers can typically bale during those hours of the day when the hay would otherwise be too dry to bale, which increases baling windows, allowing operators to be more productive. Many steamer owners are able to reduce tractor and baler fleets because of increased baling windows. This not only saves you money on capital and maintenance expenditures, but it also allows you to bale consistent and quality hay during those hours of the day when you would normally be shut down. With the DewPoint hay steamer, it’s possible to make consistent bales across a wide variety of windrow and weather conditions. In this video and blog, we will discuss how to monitor bale moisture during baling, and how to adjust steam rates to reach your optimal moisture level. In the video you will notice a small green control box above the steamer monitor. That’s the monitor for the Gazeeka moisture sensor. Most of our customer will either purchase a Gazeeka moisture sensor or some other kind of moisture sensor. The Gazeeka moisture sensor is a non-contact microwave sensor that transmits high frequency electromagnetic waves between two antennae. The two antennae are mounted on the baler so as to analyse the hay bale as it exits the baler. The display unit in the cab provides moisture readings every few seconds. We use these moisture readings to adjust how much steam we apply to the hay. We know that desired moisture levels vary from state to state. In dryer, more arid states, operators aim for bale moisture content between 12-15%. In wetter, more humid climates, bale moisture content will be higher, and preservative spray will often be used in conjunction with the DewPoint hay steamer. 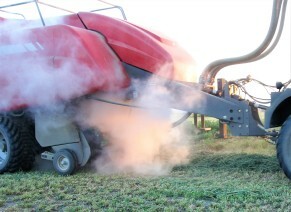 In wetter climates, steam is still effective at maintaining leaves during baling. Because the Gazeeka moisture sensor measures the bales as they are ejected from the baler, moisture readings will be 2 bales behind. So, when making steam adjustments, it’s important to slowly increase steam rates. Also, it’s important to remember that your steam rate changes will take 2 bales to show on the Gazeeka display unit in the cab. 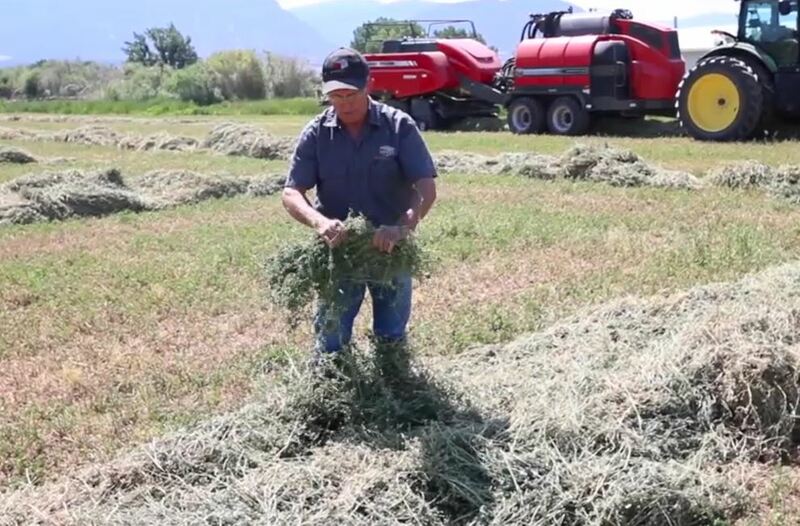 In the video, Dave makes several small steam rate adjustments, but he makes sure to wait a few bales between each rate increase until he reaches his optimal moisture level. There are many benefits that come from using steam during baling, but there’s one particular benefit that sometimes gets forgotten – the impact that steam has on your baling speed. Here are some important things to keep in mind when it comes to field speed and the DewPoint steamer. Using the DewPoint hay steamer can actually increase field speeds by 15-25% higher than conventional baling. That’s because the crop is softened by the steam which allows not only more crop to be packed into each each flake, but also to pack easier into each flake. Conventional bale flake counts of 40 flakes/bale can typically be reduced to around 30-35 flakes/bale when using steam while maintaining excellent bale conformation and higher bale density. Steam is more effective when the baler is fed to full or nearly full capacity with the stuffer cycling on every plunger stroke. Load settings can be decreased by 5-10% while still achieving higher bale density. Increasing field speeds will make your operation more efficient while increasing the quality of your hay product. Not only does increasing your field speed make you more efficient, but it will also allow the steam to be more effective. When the hay is coming across the pickup and into the packer chamber at a full capacity rate, the steam is entrapped in the hay more efficiently than if you are baling too slow. Much more steam is lost to the atmosphere when you are not feeding the baler to full or nearly full capacity. Ideally field speed should be as fast as necessary to feed the baler to full or nearly full capacity with the stuffer cycling on every plunger stroke. We understand that thin crop yields and/or rough field conditions may limit field speed and lower steam efficiency. This underlines the importance of thorough seedbed preparation to provide a firm, smooth, field surface for the entire crop cycle. Proper seedbed preparation pays good dividends over the life of an alfalfa stand by reducing wear and tear on equipment and operators, allowing higher field speeds with higher tons/hour baler capacities, and reducing crop loss associated with rough field surfaces. The DewPoint 6210 has four different steam valves that correspond to four different steam manifolds on the baler – 1 bottom front manifold, 1 bottom rear manifold, 1 top front manifold, and 1 top rear manifold. See picture below. The operator can control each of these steam manifolds individually for complete control in a variety of weather conditions. Being able to adjust where the steam is applied to the windrow, allows farmers to make hay that has consistent leaf retention and moisture content all the way through the bale. 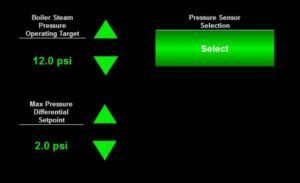 The first principle to remember is to set the valves where you want more stream applied to the fully open position. The second is to set the valves where you want less steam applied to a lower position as needed according to the conditions you are operating in. The third principle is to use the master steam slider to control the overall steam rate to achieve the desired moisture level in your bales. Now let’s discuss some common scenarios that you could face when operating the DewPoint hay steamer, and how you would adjust your valves for optimal leaf retention and bale quality. Set the Top Front and Top Rear Valves somewhat lower, perhaps between ½ and ¾ open depending on the amount of natural dew coming into the top of the windrow. Use the Master Steam Rate Slider to control the overall steam rate to achieve the desired moisture level in your bales. 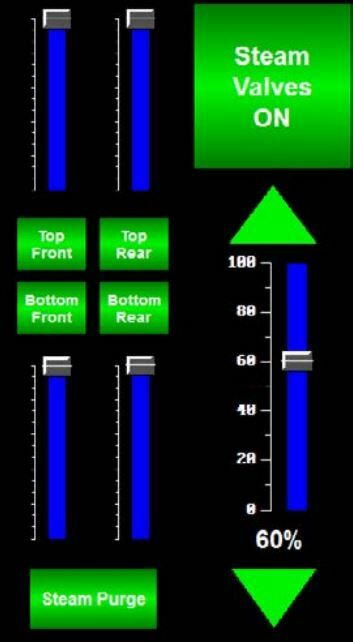 As the natural dew continues to increase in the top of the windrow you can lower the setting on the Top Front and Top Rear Valves as needed, and continue to use the Master Steam Rate Slider to control the overall steam rate to achieve the desired moisture level in your bales. This is what the touch screen in the tractor cab would look like for Scenario 1. In this scenario you are baling in the morning as natural dew is moving out of the top of the windrow but the bottom of the windrow is still moist from natural dew. Set the Bottom Front and Bottom Rear Valves somewhat lower, perhaps between ½ and ¾ open depending on the amount of natural dew remaining in the bottom of the windrow. As the natural dew continues to decrease in the bottom of the windrow you can raise the setting on the Bottom Front and Bottom Rear Valves as needed, and continue to use the Master Steam Rate Slider to control the overall steam rate to achieve the desired moisture level in your bales. This is what the touch screen in the tractor cab would look like for Scenario 2. In this scenario you are baling in the daytime with no natural dew. The hay is dry but the daytime temperature is less than 90 deg. F and winds are calm. Set All Valves to fully open. This is what the touch screen in the tractor cab would look like for Scenario 3. In this scenario you are baling in the afternoon with no natural dew and the windrow is “bone dry”. The wind is blowing at 10-20 mph and the temperature is near 100 deg. F. These are less than ideal baling conditions but you need to continue baling because of an approaching storm system or to keep up with your baling schedule. Set the Top Rear and Bottom Rear Valves to fully open. Set the Top Front and Bottom Front Valves to about ¾ open. In these more adverse baling conditions you can run the Master Steam rate up as high as is needed, even up to 100% if necessary to reach a good bale moisture level. Remember in these conditions it is best to run the Top Front and Bottom Front Valves at a lower rate because you will still get good leaf retention at the baler pickup. The Top Rear and Bottom Rear Valves will apply the majority of the steam to the windrow as it passes through the Packer area of the Baler and this moisture will stay in the hay as it passes through the Stuffer and into the Bale Chamber. 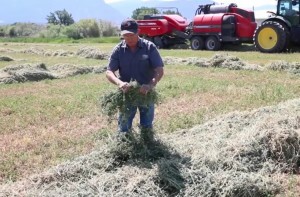 This method will allow you to make good hay in more adverse conditions when it is necessary. Remember that when you are baling in high temperatures and using high steam rates you should monitor your bale temperature using a suitable bale temperature probe to be sure your internal bale temperature does not exceed 135 deg. F. Any temperature probe must remain in the bale for a few minutes to obtain an accurate bale temperature reading. Click HERE to read our blog about managing bale temperature. Before Howard Bracken and his son Kirby discovered the advantages of the DewPoint steamer, they tried everything to make quality hay. Like many others in the Western U.S., they had struggled for decades to get good natural dew to bale hay. They started their operation with small-square balers where they would bale the hay before it was completely cured. With small bales, baling with stem moisture wasn’t too big of a risk, but once they moved to large balers, they knew they couldn’t push their luck with stem moisture any longer because the risk of fire was too great. The Bracken’s were having such a hard time getting dew that Howard decided to take things into his own hands. They purchased two water trucks and started spraying water on the hay prior to baling. Howard is the first to admit that it wasn’t perfect, but it was all that they had to work with. This required two extra operators and more equipment, but it was better than the alternative of bone dry hay that would surely shatter during the baling process. More Value: Making a consistent, high-quality product every time increases hay value. Kirby says, “[Exporters] know about steamed hay, and they prefer having the steamed hay. They have offered $5-$10 a ton more for steamed hay. The steamer is a significant investment, but farmers like the Bracken’s are seeing these benefits and more. The Bracken’s are confident that their steamers will last for years, due to the longevity of the machine. Click HERE to read and watch Part 1 of “A Bracken Farms Story”. In the last blog post, we talked about what to do when you first arrive in the field to bale hay. Before baling hay one should determine the condition of the windrow. This means that farmers should make sure that their hay is fully cured, and determine if there is any moisture or dew in the windrow. Often, there is either natural dew on the top of the windrow, or settled into the bottom of the windrow. This is important to know where the dew in the windrow is, so that we know where to apply the steam in order to make a consistent bale from top to bottom. 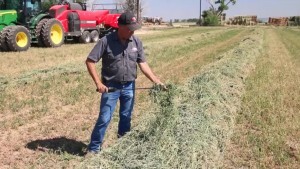 In the video, Dave determines that the hay is fully cured, meaning that there are no green stems or stem moisture in the cured hay. He also determines that the top of the windrow is bone dry, but that there is a little natural dew in the bottom of the windrow. He uses this information to apply steam to the hay when he starts baling. 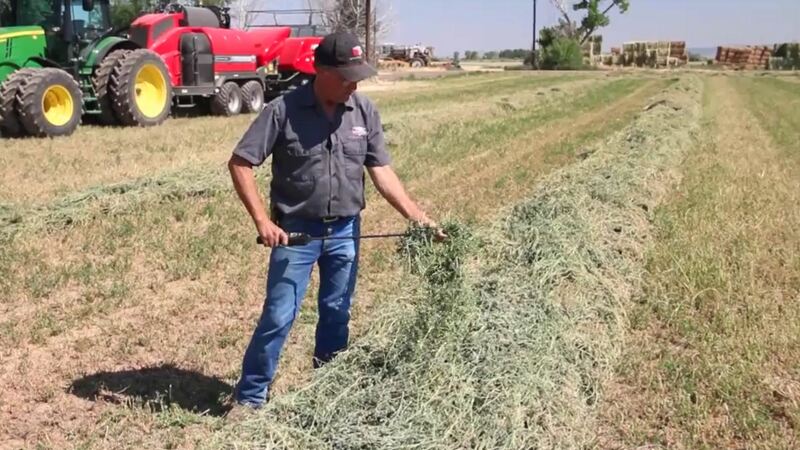 Knowing where the moisture or dew is in the windrow is important, because with the DewPoint hay steamer, we can control where we apply the steam. Typically, there are four different steam manifolds mounted in the baler. The bottom front manifold is fastened under the pickup and steams the bottom of the hay before the baler picks it up. 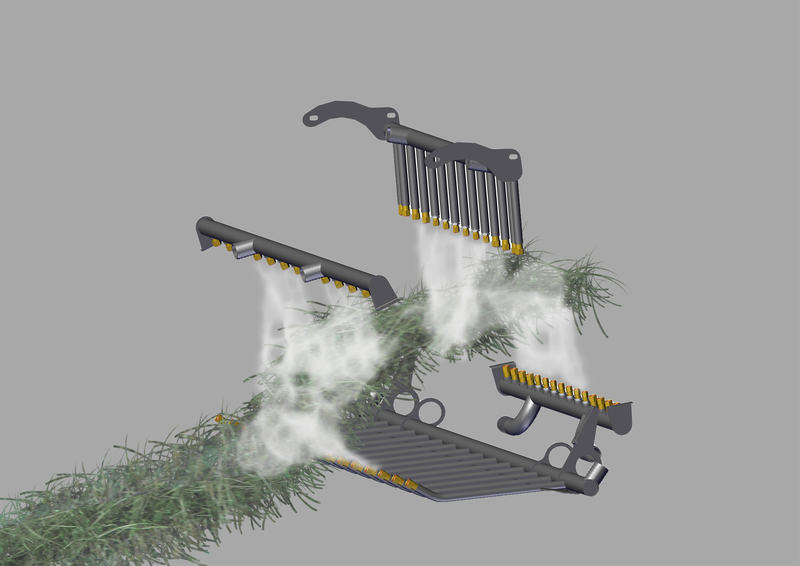 The top front manifold typically sits on the wind-guard and steams the top of the hay as the hay is picked up. Two more manifolds, as shown in the graphic above, steam the top and bottom of the windrow as it passes through the feed chamber. This combination of manifolds allows operators to make a consistent, quality product across a wide variety of weather and natural dew conditions. Using steam has been proven to reduce leaf loss by 58% compared to good, natural dew. In the video, Dave will start baling with both the top front and top rear manifolds at 100%, while both bottom manifolds are started at 60%. This is due to the moisture that is in the bottom of the windrow. The master steam slider, controls all four valves proportionally. Dave will set the master steam rate at 60% to start out. We will keep it here until the Gazeeka moisture sensor reads the moisture in the bales as they come out the bale chute. When you first start baling, it’s important to bale the first 4-5 bales with a lower steam rate. In the video, Dave starts with his master steam rate at 60%. He will maintain that steam level until he bales 4-5 bales, which will give him a feel for how much steam he should apply to the hay. Starting with a lower steam rate also ensures that we don’t make the hay too wet. Baling a few bales dry is better than baling a few bales too wet. Once the Gazeeka moisture sensor reads the moisture of the first 4-5 bales we can adjust our steam accordingly. Often, we will need to increase our steam rate incrementally until we reach our desired moisture level. 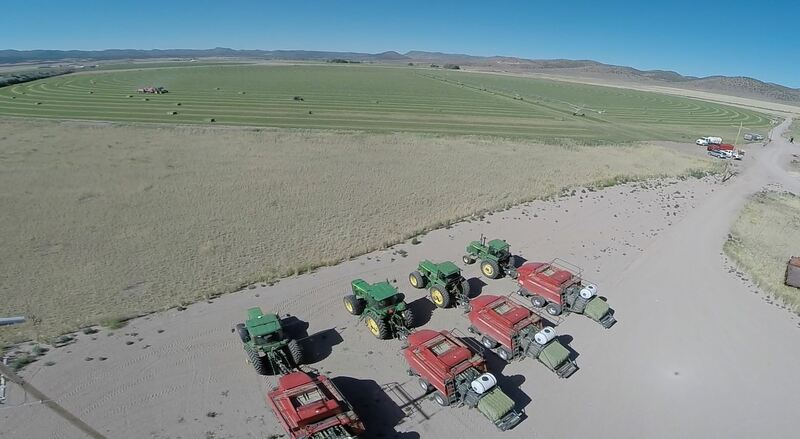 In Utah, our optimal bale moisture should be between 12-15%. 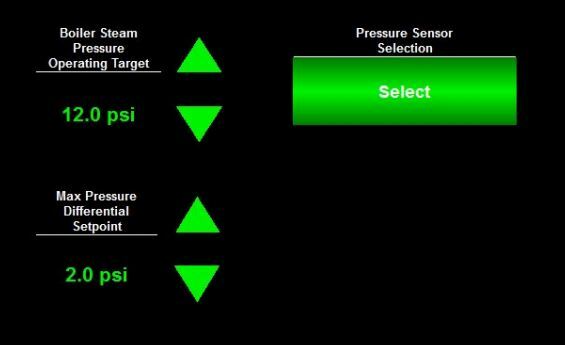 The DewPoint machines are designed and programmed in a way that maintains boiler steam pressure automatically, without any input from the operator. Once the machine is put in field mode, all the operator must do is adjust the steam rates according to the Gazeeka moisture readings. 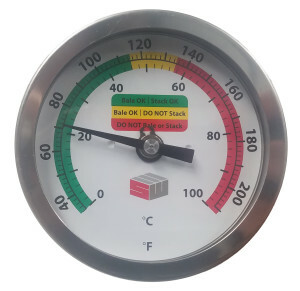 The boiler is programmed to maintain an operating pressure of around 12 PSI. Depending on the steam rate, the DewPoint machine will either turn off or turn on the burner automatically or release excess pressure through the steam purge valve in order to maintain a constant steam pressure. Now that we know how to properly start baling with the DewPoint hay steamer, our next blog will cover some best practices when it comes to applying steam to the hay. We will cover the different valve adjustments that you have available to you as you encounter different dew conditions. When you first arrive at the field to bale, you should understand the moisture characteristics of the windrow. If your hay is fully cured and has some natural dew, be sure to understand where the dew in the windrow is, or if you are baling with stem moisture, make sure you understand that as well. Checking the hay in the windrow in several different locations with a moisture probe is a good technique for determining how much moisture is in the windrow. Sometimes, there can be more moisture in the bottom or top of the windrow and in different locations in the field. Knowing where the moisture is at in the windrow is important because with the DewPoint 6210, an operator can add more moisture in the form of steam to either the top or bottom of the windrow as the hay is picked up by the baler. So, in the case of the video, there is still natural dew in the bottom of the windrow, but the dew on top has burned off. Dave will know to add more steam to the top of windrow and less steam to the bottom in order to make a consistent bale all the way through. Besides using a moisture probe, there are other techniques that you can use to determine if your hay is fully cured, or if there is stem moisture present. One method is the twisting method. You take a handful of dry hay from the windrow and give it a strong twist. If it breaks easily within the first 1-2 twists, it is likely that the hay is fully cured. Stems that are fully dry should break apart easily when you twist the hay. To check for stem moisture in the hay, take your thumb and try to peel off the skin of the alfalfa stem. If you peel off the skin of the stem and discover a green stem underneath, then you likely have stem moisture. If you can’t peel off the skin of the stem, then it likely means that you don’t have stem moisture and the hay is fully cured. Baling with steam is much more effective when the hay is fulled cured. Fully cured hay allows hay to absorb the steam and become soft and pliable. We don’t recommend baling with stem moisture when using steam. Once you determine that your hay is fully cured, and you know the condition of the hay in the windrow, it’s time to jump in the cab and start baling. In the video, we have determined that the hay is pretty dry, but the bottom of the windrow still has dew in it, so Dave adds more steam to the top of the windrow. We like to start with the steam rate a little low until we run a few bales through the baler. This allows the Gazeeka moisture sensor, which is mounted on the back of the baler, to pick up a moisture reading across the entire width of the bale. 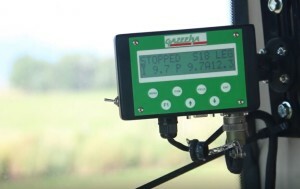 Once you receive the moisture readings from the Gazeeka, you will know exactly how much steam to add to the hay. In the video, we start our master steam rate at 60%, and we will slowly increase that until we receive moisture readings between 12-15%. Now that we’ve discussed what to do when you first arrive in the field, and we have determined the condition of our hay prior to baling, our next newsletter will cover the actual field operation of the DewPoint 6210 and how to set the steam rates on the different top and bottom steam manifolds located on the baler. Stay tuned! Baling hay with the DewPoint hay steamer opens up baling windows that no one ever knew were possible. E.g., Baling hay during the middle of the day on a hot, windy, June day. Although baling hay without the need for natural dew is convenient, farmers should carefully manage bale temperatures when baling during the day in high ambient temperatures. In fact, farmers should never allow bale temperatures to exceed 135 deg. F.
Naturally, moisture in the form of steam does add heat to the hay, and bale temperatures can become excessive during high ambient temperatures when a high rate of steam is used to bale hay. When baling with high rates of steam in high ambient temperatures, take regular bale temperature readings to be sure you are baling within a safe temperature range (below 135 deg. F). When bale temperatures approach 135 deg. F, it’s important to either reduce steam injection rates or wait until a cooler time of day to bale. When bales are baled too hot (135 deg. F. or above) hay will caramelize, smell like tobacco and turn brown. Not only does the appearance of the hay decline, but so does the value and digestibility of hay. In fact, bale heating can cause some of the protein and fibre to become less digestible. Although hay may be baled up to 135 deg. F, hay should not be stacked when bale temperatures exceed 115 deg. F. We suggest allowing the hay to cool before stacking and storage. Allowing hot bales to sit overnight, will decrease bale temperature, and allow the hay to be stacked and stored. What if a rain storm is coming and we need to get our hay out of the field? Our next blog post will cover best practices and techniques to stack hay that would otherwise be considered too hot to stack. Although baling with steam does allow farmers to bale during the day, we still suggest that you bale during cooler hours of the day and at night if possible. We will be the first ones to tell you that we have baled over 500 acres in one day and have ran the steamer around the clock in order to get the work done. We have customers tell us all the time that they were able to beat a rain storm and put up quality hay with the steamer when they otherwise would have been forced to either wait and risk getting rained on or make the decision to bale dry hay in order to beat the storm. In that sense, the steamer pays for itself over and over again. However, if possible, using the DewPoint hay steamer during the cooler hours of the day and at night will reduce fuel and water consumption, and make an even better quality product. Managing bale temperature is very important, especially when using steam to bale hay. It is so important that we actually send every new machine with our custom bale temperature probe, which provides farmers with a guide to when it’s okay to bale and stack their hay.